Kaila (not her real name) came to Montaña de Luz when she was eighteen and today she is thirty and still with us. Kaila is our most unique resident. Kaila is tri-lingual, speaking Spanish, English, and Garifuna. She is also mentally challenged and so she finds it somewhat difficult to communicate in any language. In the United States she would probably do very well in a small residential program. Those don’t exist here in Honduras, but she seems quite happy with us. We don’t really know much of her history. Her mother was HIV positive and died with AIDS. Still, we do know that Kaila did not contract HIV vertically. The circumstances under which she probably became HIV positive cause one to tremble. There is a narrative of what might have occurred in our records, but its veracity is in question. 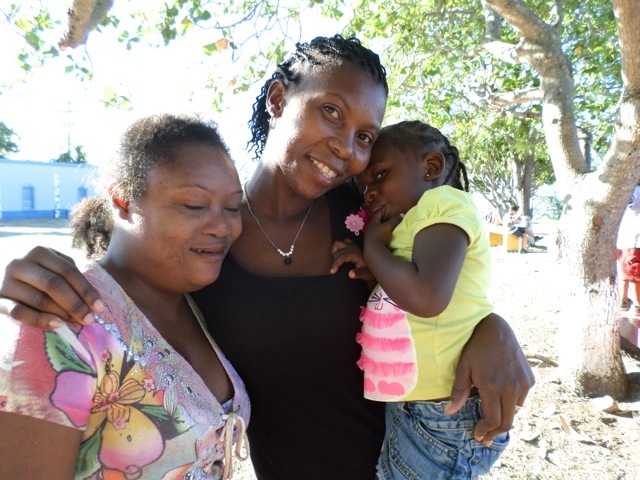 After her mother died, Kaila went to live with her biological father on the island of Roatan. Kaila was the oldest of four half-siblings, but did not have a full sibling. Shortly after going to live with her biological father, she came to Montaña de Luz. Since then she has had no contact with her family. Montaña de Luz, for all intents and purposes, has become Kaila’s family. Kaila’s sister Debra (also not her real name) lived with Kaila until their mother died when Debra was six. Now married with a two year old girl and a nursing career, she began a search for her lost sister. Her family, either because they didn’t know or were unwilling to disclose, had no information to share with Debra as to her sister’s whereabouts. Many of them said she was dead and Debra should just leave well enough alone. Kaila’s father, who presumably did know where Kaila was, said nothing to Debra. He even said that he didn’t care to know anything about Kaila even if Debra should find her. Debra started randomly calling hogares (orphanages) around Honduras, asking if Kaila had ever lived there. A little over two months ago, she called Montaña de Luz and our director told Debra that Kaila was alive and well living with us. Since then, Debra and Kaila have had a couple of conversations over the telephone and Debra promised that sometime soon on a Sunday she would visit. Every Sunday since then Kaila has become excited telling us that her sister was coming. Last Sunday she seemed even surer than usual, as if she had some special insight. In fact Debra had called the director that very morning to say that she and her two year old were coming to visit. Our director was away that week and weekend, so it would fall to Laura and I to assist in the reunion. It, of course, would have to be one of the craziest and busiest Sundays we have ever had. Sundays are hectic anyway as we are generally driving our children back and forth from Mass to Sunday School and to catechism classes. There was also a group here from the states and there are always special things needing to be done for them. As it turned out, another family showed up unexpectedly to visit their five-year-old nephew. They had just finished their visit and we were returning them to Ojo de Agua, some seven miles away, so they could catch a bus back to Tegucigalpa. Just as we started out with them, our director called to say that Debra and her two-year old daughter were waiting at the entrance of our town. Now we had one-hundred and one decisions to make in a three minute span of time. We would certainly pass Debra on the way, but there wasn’t much room in the truck and we didn’t think that it would be the most gracious thing to ask anyone to ride in the truck bed. We also had our laundry in the truck that we were going to drop off at our house. This now seemed an unreasonable thing to do as well. In the end we decided that we would leave the family that was with us at the entrance to the town, pick up Debra, drive Debra back to Montaña de Luz, then return and pick up the family we had left and drive them to Ojo de Agua. This was not the most ideal situation, but given our choices, we thought it would be the least offensive to all of our guests. We stopped at the entrance of the town. The family with us graciously got out of the truck and said they didn’t mind waiting the ten minutes it would take us to return. We met Debra and her child and they climbed into the truck. It seemed like it was going to work. But then God, fate, or Karma intervened to spoil the best laid plans of mice and the Manships. I went to circle the truck out onto the main road and pull around 360 degrees to return from whence I had come. There’s a big ditch at the entrance to our town. I bottomed out the truck (I did this once before, but we won’t talk about that). It’s very embarrassing. All the strong, healthy, Honduran men (thank God they were there, again) had to pull, push, and lift the gringo out of the ditch. Within ten minutes we were free. By this time Laura, who hadn’t like the plan to begin with, had decided on something different. We squeezed everyone into the truck and drove to Ojo de Agua. The first family got out for their bus, and Laura, I, Debra, and her daughter drove back. This gave us an additional ten to fifteen minutes to talk with Debra on the way back. We had never met her or spoken with her before. As we drove back it started to become clear that Debra had no idea what Montaña de Luz was. It further became clear that she did not know that her sister was HIV positive or that she was mentally challenged. As we began the two minute climb up to Montaña de Luz, Laura asked me in English, “So, Mr. Social Worker, what’s the rule book say about disclosure in a situation like this?” Kaila certainly did not have the capacity to give us consent to disclose. Her sister certainly had a need to know. In anywhere from five to ten minutes she was going to find out about her sister anyway, and that would not be what you would call an ideal disclosure. I slowed the truck down to a crawl and Laura calmly explained what Montaña de Luz was, that her sister was HIV positive, and why her sister was still at a home for children when she was thirty years old. Tears flowed, but we made it up the hill without bottoming out in any new ditches. When we arrived, Laura took Debra off to register her with our security station and I went and found Kaila and prepared her. The reunion was joyous. Of all your blogs this one about Kaila and Debra touched me the most. It is so sad to read about the life Kaila must have endured before she came to the orphanage. Yet she had a sister who loved her. The power of her sister’s love is beautiful.